The site selected comprised of two entire wings of Pod –A with a total built up area of 340,000 Sft. The base-built facility was LEED GOLD certified. The client’s brief was to achieve LEED PLATINUM rating for the interiors. 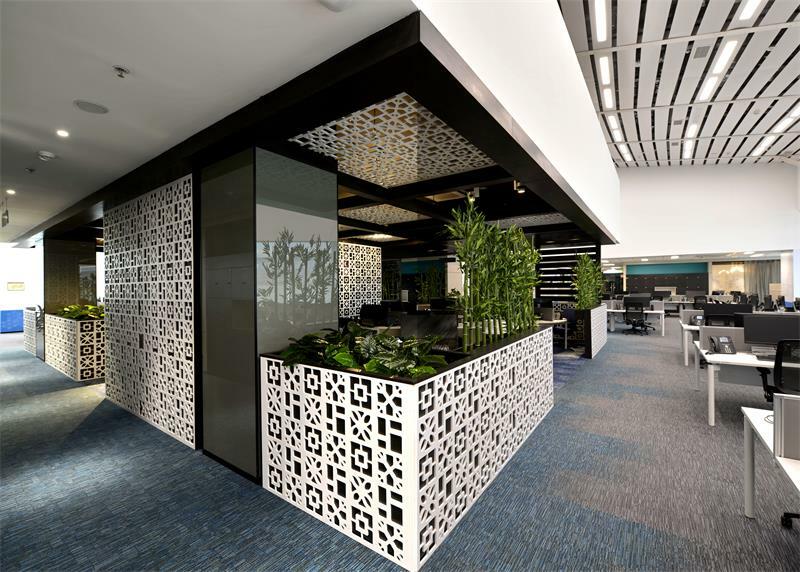 The Credit Suisse workspace in EON Pune, in many ways, is a reflection of company’s commitment to “Smart” working program, driven with a goal to attract the most talented professionals. Company believes that it can gain a competitive advantage if it can retain the knowledge and experience of their employees within the organization and grow their human capital from within. This was the underlining theme in achieving design goals. The new Credit Suisse workspace was designed with a scale of a small city block with series of neighborhoods – each with desks, meeting rooms, printers, lockers and quiet areas. Each neighborhood had a distinct personality, suited to the activities conducted within. This scale was integral to the design, as was Credit Suisse's Smart Working program, focused on improving work practices through good workplace design. Brief also demanded local flavour of Pune and India as such on a broader theme. Inspirations were drawn from traditional Indian motifs and colors. Each wing was assigned a different color based on the “Navaratna”- or the nine gems. The colors ranged from purple to yellow to emerald green to blue signifying Sapphire. Every floor thus has a distinguished look and feel. This also creates an element of surprise and mystery for the visitors. Moreover, the different colors also add to the way finding scheme. Physical program was all about movement of staff and ease of use, and did not seek to impose any rigid or hierarchical divisions. Entire office interiors had a feel of egalitarian design, where all spaces were treated equally and far removed from the typical corporate hierarchy. Apart from the non-regimented requirements of the program, building comprising of six floors itself had a non-orthogonal form. The ground level comprises of all the common amenity functions like the main reception, business lounge, board room, interview rooms, candidate hold area, cafeteria, training facilities, medical facility, resting room, prayer room mail & dispatch etc. The upper floors from Level 1 onwards are the regular work areas. All the floors are designed with 100% hot desks. Employees can log in from any desk and start working. Besides regular workstations, which makes 80% of the total seats, there are various other Activity based work areas such as Phone booths, quite zones, Huddle spaces, Think Tank etc. Over all the design of the space breaks away from the typical regimental format and brings in a lot of freshness which has led to employee satisfaction and improved their overall performance.